Published: April 20, 2016 at 10:48 a.m. Updated: April 25, 2016 at 06:18 p.m. 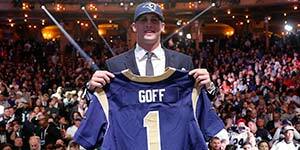 The Titans recently swindled the Rams out of a franchise-altering harvest of draft picks one year after Tennessee and Tampa Bay rejected similar windfall offers from a desperate Chip Kelly in Philadelphia. All four organizations acted in response to the NFL's overarching, inviolate reality that the value of a legitimate young franchise quarterback is beyond calculable. Even before offensive masterminds such as Bill Walsh and Don Coryell revolutionized the passing game in the 1970s and early '80s, legendary Packers coach Vince Lombardi understood that football was the perfect team game except for one conspicuous problem -- the quarterback was too important. The NFL has undergone a subsequent passing revolution over the past decade, forcing the field general's role to evolve in response to the modern game's increased demands. "Until you find your quarterback," Falcons general manager Thomas Dimitroff has acknowledged, "the search for him consumes you." Sustained NFL success correlates to steady quarterback performance whereas exhaustive searches for a solution to professional sports' trickiest position deplete resources otherwise spent stockpiling talent. The Buccaneers and Titans gave Kelly the stiff-arm last offseason because they were convinced that Jameis Winston and Marcus Mariota would quickly emerge as not just competitive advantages but also the face of their respective franchises. Although seemingly polar opposites from a skill-set perspective, both quarterbacks showed enough promise as rookies to bolster that belief. Mariota is poetry in motion, with graceful, gliding feet, a lightning-quick release, superb play-faking handiwork and pinpoint mid-range accuracy, dissecting the underbelly of defenses via quick-hitting rhythm passes into tight windows. A deceptive natural athlete and a fierce competitor, Winston is a classic big-bodied drop-back quarterback with uncanny pocket awareness and a long release, relentlessly attacking downfield and outside the numbers. Let's go in-depth to examine each of the quarterback's strengths and weaknesses, starting with Mariota. Bill Walsh was obsessed with his quarterbacks' footwork, once describing Joe Montana's movement as "almost sensual." "I remember Bill Walsh talking to me one day and he goes, 'Ronnie, look at Joe's feet,'" Hall of Fame safety Ronnie Lott delighted in Bill Walsh: A Football Life. "'They're just beautiful! They're just beautiful!'" It's a shame Walsh's equal isn't around to mold the Titans' quarterback clay into sublime football artwork. When I watch Mariota play, I can't shake the visions of Montana and Jake Plummer dancing in my head. More physically gifted than either of those retired quarterbacks, Mariota is custom-made for a boot-action, roll-out scheme such as the one Walsh invented and Mike Shanahan later refined. "He throws on the move as well as anybody I've seen," one scout raved to Bob McGinn of the Milwaukee Journal-Sentinel leading up to the 2015 NFL Draft. Walsh never sought a prototypical statuesque pocket passer throwing over the top of towering defensive linemen. He wanted one nimble enough to sidestep oncoming pass rushers in favor of finding throwing lanes, a mobile quarterback more inclined to buy time for the correct read as opposed to a scrambling sandlot sensation running for yardage. That latter point represents the primary difference between Mariota's run-action attack and Robert Griffin III's magical 2012 campaign. "When he's in the pocket, his helmet remains downfield. He never dips his helmet, which means he's constantly looking for his receivers," NFL Media analyst Nate Burleson explained after Mariota's fabulous first game. "And for a guy that athletic, that's very special. Because he can run if he wants to; he can probably go for 115 yards every game. But he wants to get the ball out of his hand, which is so good to see for a young quarterback." Later in the season, Mariota went on to become the first player in NFL history with at least 250 yards and three touchdowns passing and 100 yards rushing in a single game. For all of that obvious potential, however, there are several areas in which Mariota pales in comparison to Winston. Whereas Winston makes his living downfield and outside the numbers, Mariota ranked dead-last among qualifying quarterbacks in passes over 20 yards. The Titans' vertical attack was so feeble that Johnny Manziel completed more deep passes in six starts than Mariota's seven in 12 starts. Mariota's accuracy shines on short to intermediate throws between the numbers. The question is how much of the blame he shoulders for the lack of splash plays. While arm strength isn't an issue, his throwing motion doesn't seem geared toward a consistent deep-ball release. Too often, he floated balls that should have been heaved and overshot his receivers on routes that called for a drop in the bucket. That said, Mariota received precious little help from his surrounding talent. His receivers and running backs were the NFL's least effective while pass protection issues resulted in a league-high 54 sacks of Tennessee quarterbacks. With a treasure chest of draft picks, general manager Jon Robinson should be able to find bigger, faster receivers capable of winning the hand-fighting battles with defensive backs on the sidelines and deep down the field. Mariota can't wash his hands of the high sack numbers and hard hits. He doesn't share Winston's knack in the pocket. Tentative at times in the face of pressure, Mariota can be careless with the ball as well as his body. On balance, it's not too early to recognize the Titans already boast a quarterback with special traits. Mariota and Russell Wilson were the only quarterbacks to post three of the top 25 weekly QBR scores in 2015. Mariota's 38.4 first-down percentage ranked fourth in the league behind a trio of MVP candidates in Carson Palmer, Cam Newton and Wilson. "He is a nightmare for you," Colts coach Chuck Pagano conceded at the NFL Annual Meeting in March. "He is wired the right way. His DNA is spot on. He is a winner, a tough guy, a competitor, and he's smart. All the intangibles are there for him to be a really good football player. What makes him tough is he can beat you in so many ways. ... He is a great, great talent." Underappreciated in his prime, Plummer never fulfilled Walsh's expectations as the reincarnation of Montana. As the evolutionary Plummer, Mariota is the latest model of accurate, athletic, nimble-footed quarterbacks ideally suited to flourish in the Walsh-Montana roll-out system. What should have Titans faithful especially excited is that teammates and coaches have already begun genuflecting as acolytes to the vision of Mariota as franchise savior. As early as training camp, one undisclosed player attested, "We got the right one." By the end of the season, go-to tight end Delanie Walker nonchalantly proclaimed his vision of Mariota as a "great player" from the moment the former Oregon star landed in Nashville. New offensive coordinator Terry Robiskie is in lockstep, identifying Mariota as "a special talent, a special guy" who appears to be "just a natural-born football player." Pro Bowl linebacker Brian Orakpo went a step further, insisting Mariota is "for sure" a franchise-caliber quarterback. Pressed by NFL Media's Albert Breer, Orakpo didn't flinch: "Absolutely. They did good with that one." If Mariota is the Walsh prototype, Winston is straight out of Al Davis' central quarterback casting. Davis' classic Raiders offenses featured oversized offensive linemen protecting rifle-armed quarterbacks long enough to dial up bombs on slower-developing pass routes deep down the field. Whereas Titans coaches eased Mariota's transition by incorporating college-spread principles and read-option looks, Winston was thrown into the fire at the helm of a pro-style offense. Despite the dreadful opener versus Mariota's Titans, the draft's No. 1 pick came as billed, offering precocious instincts, anticipation passing, a large frame capable of withstanding hits in the pocket and a willingness to pull the trigger on tight-window NFL throws with power, touch and accuracy. Perhaps the most common misconception is that Winston is not a great athlete, a notion ingrained with weight fluctuations and an underwhelming performance at the NFL Scouting Combine. Make no mistake, Winston isn't a quick-twitch athlete blessed with Mariota's jump-rope feet. He moves deliberately in his dropback, delivery and pocket jockeying. Still, this is a former redshirt freshman Heisman Trophy winner who played right field for Florida State in 2013 and excelled as a closer a year later, spinning a mid-90s heater to post an ERA below 2.00 for his college career. Winston has the cagey moves of a veteran, reliant upon tricks of the trade -- such as a highly effective pump fake to juke would-be tacklers on first-down scrambles -- and a natural feel for the situation. Mariota might have the reputation for extending plays, but Winston pulled the feat off with more regularity as a rookie. Houdini-like in his escapability, Winston has the unique peripheral vision to detect swarms of uniforms -- a sixth sense which Montana once dubbed "feeling the color." "When the defense puts on a strong rush, I see the colors," Montana explained. "I only see colors, not faces, helmets, arms or legs. Just that wall. If the 49ers are wearing red jerseys and our opponents white, my vision picks up the changes. If the wall of color quickly changes from red to white in the first two steps of my dropback, things register automatically." That preternatural sense not only tells Winston when to flee the pocket, but also functions as his nose for the first-down marker and the goal-line. A quarterback boasting Mariota's fancy footwork should be expected to find his receivers on the run. It's a testament to Winston's pocket presence, underrated athleticism and strong, accurate arm that he's every bit as effective as Mariota when forced to throw intermediate and deep passes off of one foot. Not to be overlooked, Winston grew in stature throughout the season, graduating from laid-back rookie to inspirational leader. It's a testament to his natural competitive fire, situational awareness and charisma that he was already functioning as the team's emotional bellwether by December. For all of Winston's obvious strengths, he wasn't without equally obvious weaknesses. He struggled with his mechanics out of the gate, showing sloppy footwork and suspect decision-making in September. A red flag entering the draft, immaturity concerns also resurfaced last offseason as Winston tipped the scales at 250 pounds. Although he dropped down to 231 by September, he was never in peak football shape. It's a promising sign that Winston has recognized the commitment level of the game's elite quarterbacks. Upon returning from the Pro Bowl, he set out transform his body via early-morning workouts at One Buc place. "Jameis is very perceptive about not only what he needs to get better but what our offense and our team needs to get better," coach Dirk Koetter recently explained. "That's one of the things when you're around him more, he's mature way beyond his years with that sort of thing. The reason I got a smile is because that's a good thing for the Bucs." Outside of the utter bedeviling Winston experienced at the hands of the NFC South champion Panthers, the Bucs' coaching staff has to be impressed with his steady upward trajectory throughout the season. Who has a brighter future? It's natural to hold tight to a first impression. Mariota entered his rookie season with a head of steam on the heels of an "essentially flawless" August. The draft's top two picks went on to make NFL history, matching up for the first time ever in the season opener -- 259 days after their Rose Bowl showdown. Mariota was sensational from the start, becoming the first quarterback since 1960 to generate a perfect passer rating in an NFL debut. The Titans actually scored more points in the first half of Mariota's debut (35) than they did in any full game (28) the previous season. Winston, on the other hand, was a bundle of nerves, showing inconsistent mechanics and heavy feet behind an offensive line he didn't quite trust while staring into coverage he had trouble deciphering. To borrow a phrase from Gregg Rosenthal's painstakingly curated QB Index, Mariota was as steady as a metronome the rest of the way in contrast to Winston's week-by-week improvement. I entered this project with a decidedly pro-Mariota bias. By the time I watched every dropback from their respective rookie seasons, though, I had a clear-eyed understanding of the pro-Winston faction's case. In a side-by-side comparison of such disparate skill sets, the answer must factor in scheme fit and risk. Will Mariota reach his ceiling absent a Walsh-like Svengali? Is Winston the perfect fit for Koetter's system? Does Winston carry more risk due to perceived pre-draft immaturity issues, a long release, a lack of explosiveness in his legs and game-to-game inconsistency? Does Mariota carry more injury risk in addition to the downfield woes and a worrisome reliance upon the read-option last season? It will be years before those questions are answered definitely. While I still lean toward Mariota's upside, both franchises can rest comfortably in a league where talented young quarterbacks carry inordinate value.